With friends like this ... Europe our enemy and Russia our best friend. I must be reading an Orwellian novel, at least a revamp of the fabulous book “1984”. Because we have been deceived all these years. In a twist of fate, we learnt this week that Europe was our enemy and Russia was our best friend. With an ally and a friend such as the U.S. who wants an enemy? This new knowledge comes as quite a shock and for many hawks in the GOP they have been sorely misled, all these years. Yes, indeed the world is a strange place. And of that dozen or more agents that Mueller recently had charged and the student who was charged just yesterday or was using the NRA to compile news that would affect the election, these charges are all whimsical fantasies. With all this going on, no wonder Wall Street had a quiet day. It was compelling news folks. And the best part is that when the Don doubles down in an Orwellian twist these stories, will all be fake news, and never happened. So, what did happen on the day? Not much. Equities shifted a little on earnings. However, for market pundits, the slew of data over the next few days will have some importance. The trade tensions have had little impact at present. However, if enforced, then there will be effects. Some have already bitten. Whirlpool unable to compete with other white goods manufacturers sorely pressed Trump for tariffs on competitors. Let’s be frank the company, needs every bit of help it can because it still makes an sells a 50’s era washing machine and cannot compete with the Europeans and Korean white goods manufacturers. They got what they wanted. However, the company has found prices of raw materials have ballooned and demand from consumers has waned. At the current rate of decline, Whirpool will struggle to be around for another 20 years. Neel Kashkari, the Fed President from Minneapolis (non- voting), raised concerns that the Fed should halt all rate hikes because of the rapidly flattening yield curve. Kashkari argues that with the curve where it is, the yield curve is signalling that the Fed has achieved a market neutral level. The yield gap between 2/10-year treasuries is now about 25 bp, the lowest level for 11 years. 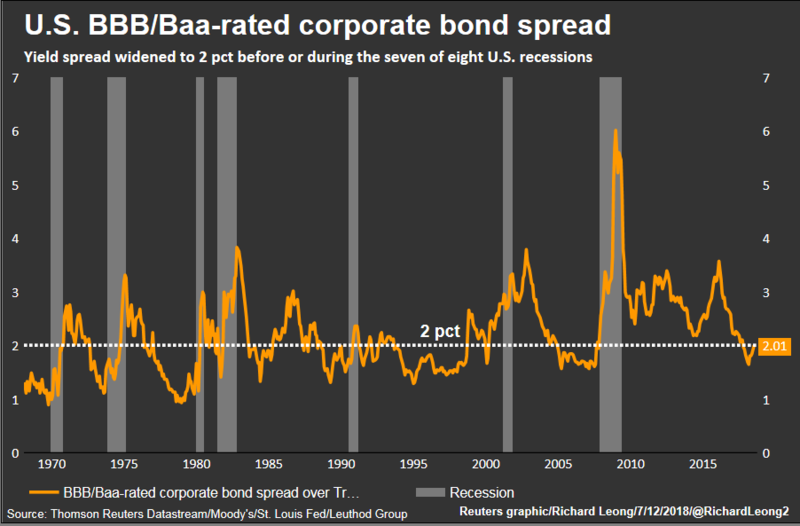 In yet another twist, the risk premia on Baa-rated corporates over treasuries is now at 2% (according to Moody’s). This milestone was reached either during or just before six of the past seven U.S. recessions since 1970. And in yet another twist, heralding a flatter yield curve, hedge funds have cut their record short positions of 500,000 contracts to a mere 61,000 contracts, a sure bet for a flatter yield curve. Net short positions on the two-year futures are very small. Equities: The S&P fell 0.10% The Dow rose 0.18%. The Stoxx 600 fell 0.3%. Bonds: The ten-year closed around at 2.86 on the back of higher retail sales for June. The 2-year closed at 2.599% and the 30-year closed at 2.96%. The ten-year bund closed at 0.30% and the UK gilt closed at 1.28% and the OAT closed at 0.592%. The U.S. curve closed the day with the following closes 2/10 at 25.9 bp, 2/30 at 36.3 bp and the 10/30 closed at 10.2 bp. The U.S. 5-year closed at 2.75%. Commodities: WTI fell 3.9%. Gold rose 0.34%. Bitcoin is trading around $6,665. Markets should be quiet today. Bonds should look to sell off a little following the trend out of the U.S., the only caveat being noise around tariffs. Any news relating to tariffs being implemented will probably see equities weaker and bonds stronger for the time being, until other concerns arise. Equities to be mixed on the day.